What do you get when you combine myopia, Catholic school and a pair of identical twins? A prank worthy of April Fools. One spring day in fourth grade, my twin and I — gangly and definitely awkward — decided to trick our teachers. At recess, Jessica and I, in our parochial plaid jumpers, simply switched glasses. Mine, a pale pink; hers, a sky blue. The teachers blew the whistle and in we went, into each other’s classrooms. Jess and I, and our friends who were in on the joke, giggled like schoolgirls. Soon, the teachers connected the dots and sent us back to our respective rooms. Our joke didn’t last long at all, but it was so exhilarating. My sister ran into my teacher a few years ago. She laughed at the memory and remembered both of us fondly. As an adult, I still appreciate a well-designed duping. In fact, for a few years, the April edition of OWP was a vehicle for high jinks in article form. 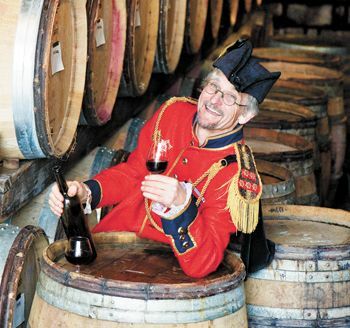 April 2008, John Paul of Cameron Winery graced the cover in grape-covered undies — assembled by me — with a tricorn hat, a general’s jacket and rain boots. The story? “John Paul and the Cascade Republic: Oregon secedes where others fail,” by Riggs Fulmer with well-staged, intriguing photos by the talented Andrea Johnson. In the same edition, we covered the world’s first 102-point wine: an Oregon Pinot made by Domaine Chateau — I kid you not, I received e-mails asking where to purchase a bottle. Fast-forward to 2019, and, once more, we are up to no good. While I think it’s pretty easy to spot the faux stories — only two — by end of the article, you’ll know for sure. I will say, editing the copy had me giggling like a schoolgirl. I felt that identical rush of excitement I did so many years ago switching it up on the playground. As long as no one gets hurt, it’s all fun and ... April Fools!